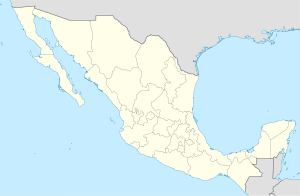 San Juan de Sabinas is one of the 38 municipalities of Coahuila, in north-eastern Mexico. The municipal seat lies at Nueva Rosita. The municipality covers an area of 735.4 km². As of 2005, the municipality had a total population of 40,115. In 1908, it was the scene of the Mina Rosita Vieja disaster, the worst disaster in Mexico's coal mining history. ^ "San Juan de Sabinas". Enciclopedia de los Municipios de México. Instituto Nacional para el Federalismo y el Desarrollo Municipal. Retrieved November 8, 2008. This page was last edited on 26 March 2017, at 21:55 (UTC).